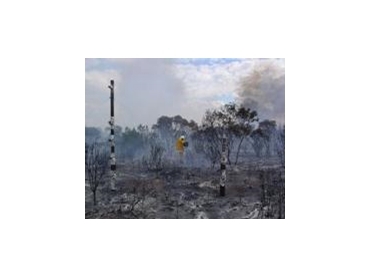 After identifying a need to conduct measurements of flame front properties in wildfires, the Bushfire Cooperative Research Centre from CSIRO developed a rapid-deployment, multi-sensor system to measure fundamental fire behaviour properties in experimental and wildland fires. Incorporating Campbell Scientific Aust instrumentation, the multi-sensor system measures heat fluxes, fluid flow velocities and radiation characteristics in bushfire flames. Campbell Scientific Aust CR10X and CR3000 data loggers with an AM25T thermocouple multiplexer were chosen to measure the complex sensor arrangement consisting of custom-made narrow-angle radiometers, small diameter K Type thermocouples and third party dual heat flux sensors. The Campbell Scientific Aust data loggers were chosen for their low power needs, ruggedness, accuracy under temperature extremes, high speed measurement and fast processing capability. Flame temperatures, flame radiation, convective and radiative heat fluxes and flow velocities within the flames are measured during the experiments. A major challenge overcome during the design phase was to develop a multi-sensor measurement package that would be light enough to allow rapid deployment on short notice and robust enough to survive the extreme environment that characterises high intensity flames. The equipment has now been operating in excess of three years, during which time the Campbell Scientific Aust data loggers have performed reliably under hostile environmental conditions. The type and number of sensors integrated in the multi-sensor measurement package permits spatially and temporally resolved measurements of the heat that is driving the fire. These flame-front measurements will set the base data from which physical-based modelling frameworks will be developed to build the next generation of fire behaviour models.